Using the project backlog brings task management to a new level. Split it to sprints, change priorities by drag'n'drop, set features statuses, add "ToDo" tickets for project and see sprints statistics. 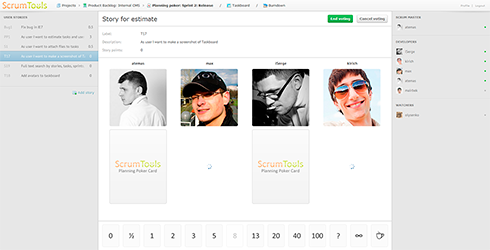 Close correlation of the backlog with Taskboard, Planning Poker and Burndown Chart makes it the main page of your project. It's exactly copy of your office task board on the wall. All team members can move, add and change tasks at once. And they see changes live without page reload. All sprint stats are updated immediately. Simple management of the task statuses, such as "ToDo", "In Progress", "Ready for Test", "Done" etc. Manage these stages as you wish. Functional, beautiful and handy table for Planning Poker. Voting is online, so you will not feel the difference with "live" voting. And do not forget to put an avatar — it will be much be nicer. Easy way to see how much is left to do for iteration. You can see if you in time for the deadline and quickly adjust you plans for deliver on-time. You do not need to calculate days (or hours) by yourself — just press "Generate point for today" button.